This festive season I've been working closely with my friends at Egg Farmers of Canada to celebrate fresh, local, high-quality eggs, and the versatile role they play in holiday entertaining. Eggs are certainly an ingredient I often use in my kitchen, and dishes made with Canadian eggs take on a special meaning because of the farmers who produce them. Here are a few things I've learned. The holidays are about enjoying the season with friends and family. If you're like me, this time of year is also about delicious food. And planning the menu and cooking for loved ones is a big part of the holiday cheer. This festive season I've been working closely with my friends at Egg Farmers of Canada to celebrate fresh, local, high-quality eggs, and the versatile role they play in holiday entertaining. Eggs are certainly an ingredient I often use in my kitchen, and dishes made with Canadian eggs take on a special meaning because of the farmers who produce them. Eating local here in Canada is easier than you might think, even in the cold winter months. Canadians are lucky to have farmers working hard year-round to make sure we have access to fresh, local and high quality food. And the best news? You can find their products at the supermarket or even your corner store! 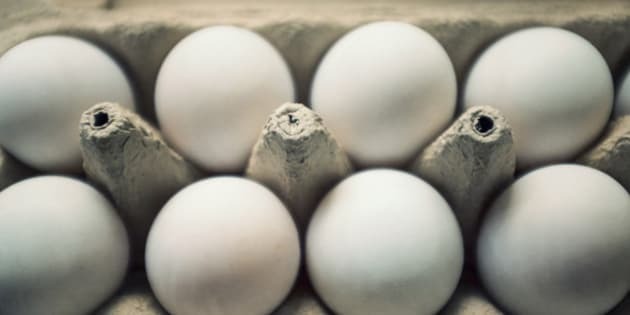 Under the system of supply management, the eggs you buy at the store are among the best in the world for quality and freshness, and are locally produced. This means, every time you reach for eggs this holiday season you're supporting Canadian farmers. And that's definitely something to celebrate! Fresh eggs are probably the most versatile ingredient you can use during the holidays. From delicious deserts (like my mouth-watering sticky toffee pudding with cranberry caramel and eggnog mouse) to turkey stuffing -- they taste great in everything. With eggs featuring throughout your meals, you are already on your way to a terrific farm-to-table holiday event. What's more, every time you get creative and use fresh ingredients, you're giving back to Canadian farmers and supporting Canadian agriculture. Farmers are the backbone of our country, and I am proud to serve their fresh produce at my restaurant and in my home. We have over 1,000 family-run egg farms in Canada who adhere to the highest standards for farming and who also give back to their local communities. These farmers work hard every day to provide the best and freshest product to millions of Canadians. Our farmers really are the unsung heroes of our holidays, and supporting them is as easy as checking off the items on your grocery list. If you're looking for ways to create the most delicious holiday meal using fresh ingredients, you can check out my recipes at eggs.ca or join the conversation online with @eggsoeufs. Get the 15-Minute Zucchini Pasta With Poached Eggs And Quick Heirloom Cherry Tomato Basil Sauce recipe from Half Baked Harvest. Get the Hash Brown Avocado Egg recipe from Pip & Ebby. Get the Broiled Fontina Toasts With Roasted Garlic & Poached Egg recipe from How Sweet Eats. Get the Egg-Stuffed Sweet Potatoes recipe from Roxy's Kitchen. Add Eggs To Rice -- Sure To Be Nice! Get the Honey-Lemon Bok Choy With Basmati Rice & Eggs recipe from The Fitchen. Get the Tomato-y, Yogurt-y Shakshuka recipe from Food52. Get the Petite Pea Omelet With Mint & Mascarpone recipe recipe from Half Baked Harvest. Get the Polenta With Caramelized Mushrooms, Marinara, Fried Eggs & Goat Cheese recipe from Half Baked Harvest. Get the Persian Mixed Herb Frittata recipe from The View From Great Island. Get the Asparagus Salad recipe from The Wicked Noodle. Get the Brussels Sprouts Hash recipe from Lexi's Clean Kitchen.